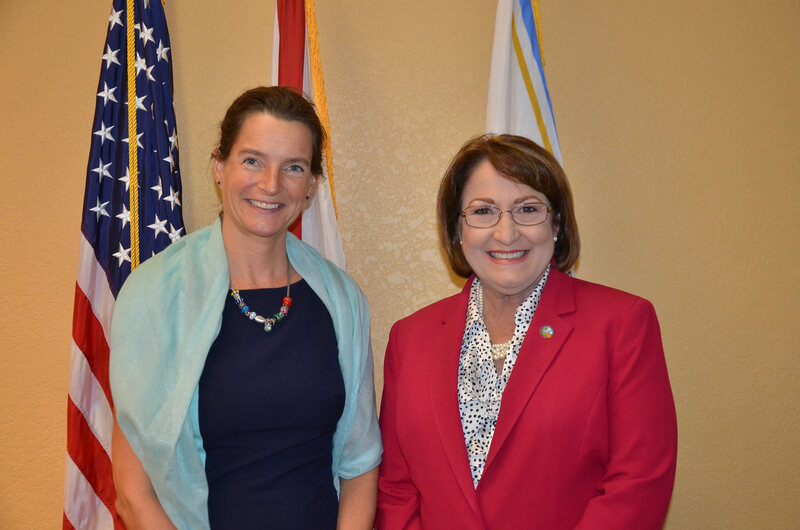 Mayor Teresa Jacobs and Orange County’s Office of Economic Development met recently with Nathalie Olijslager-Jaarsma, Consul General of the Netherlands, to discuss opportunities to encourage Central Florida tourism and business development. Olijslager-Jaarsma visited Central Florida to meet with influential organizations throughout the region, including Orange County Government, to present to them innovative technologies developed by Dutch companies and entrepreneurs. Olijslager-Jaarsma was appointed the Consul General of the Netherlands in December 2013, and is based in Miami. Mayor Jacobs and Olijslager-Jaarsma also discussed the upcoming Florida Simulation Summit, which is to be held September 16 at the Orange County Convention Center. The event will highlight Florida’s multi-billion dollar simulation industry and will help businesses identify opportunities to use commercial simulation. Photos from the meeting are available on Flickr for use by the media.